With this post i want to show you something a little bit different than usual. As a consultant you have to face the challenge of creating functional specifications which are suitable for the customer and especially for the developer to understand. An essential part of this FS and of the design process comes in the form of screenshots. There are several advantages of screenshots, for example less words needed to explain the implementations and a form of documentation that visually represents the ideas of the consultant in a relatable way for the other parties. 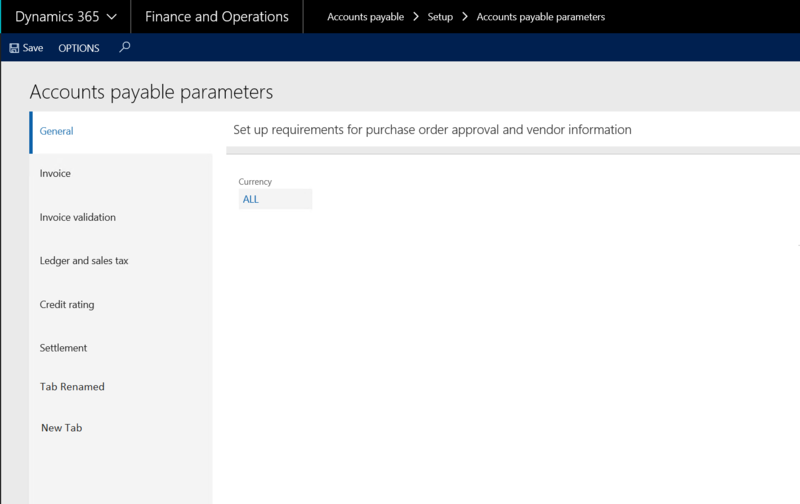 This is an example of changing up a simple parameter form, in this case the „Account payable parameters“. One tab should be renamed and an other one deleted. 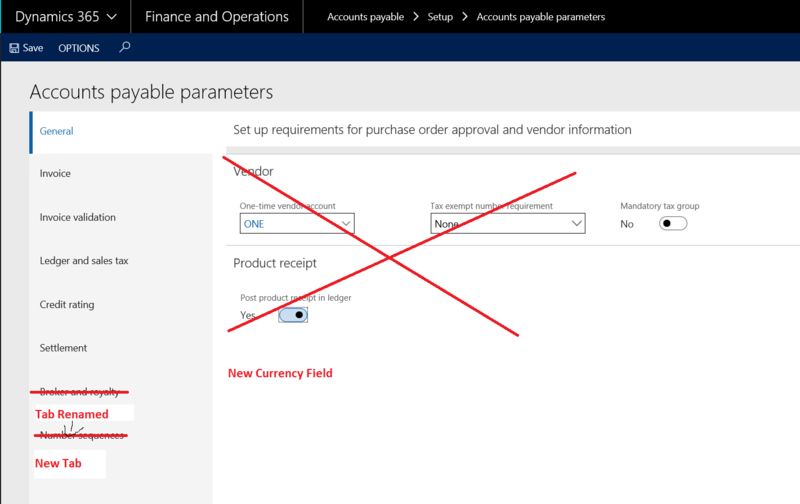 Also a new tab should be added and in addition to this the tab „General“ should only contain a new currency field. This is an example of very freuqently asked and simple changes but the screenshot leaves a lot to be desired. It’s a cluttered mess which opens up room for missinterpretations which should not be there in the first place. You can only imagine how much worse it gets the more complex the new implementations or changes schould be. Now that we discussed and know about the problem, how can we do it in a better way? There is a simple answer to this question: Paint. Paint is a tool that basically everyone has access to and it brings all the functionality we need to improve and clear up our screenshots. 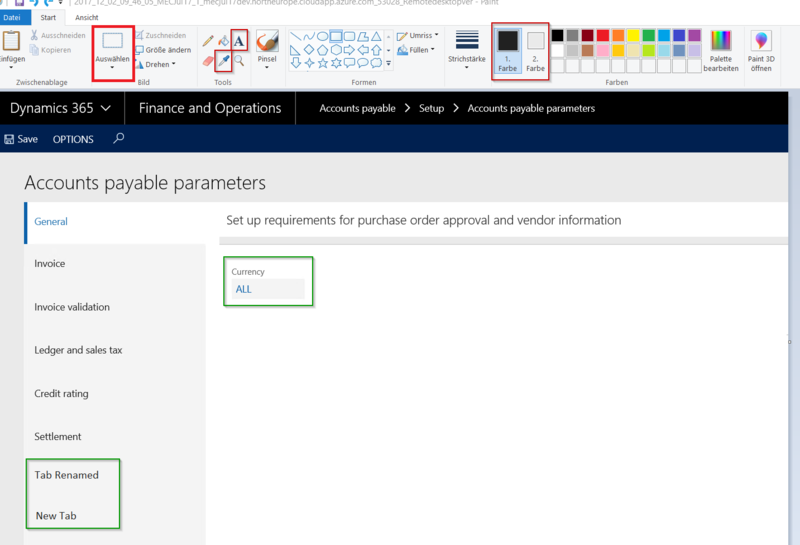 As you can see this screenshot is very clear and pretty much indistinguishable to an already extising form in Dynamics 365. With this there is no room for speculations and the developer knows exactly what he or she has to do. I marked the tools within paint that you need to accomplish this clean approach. So first of all i cut out the two tabs that i don’t need anymore and replaced them with two new text elements. I checked the exact color scheme with the inbuild paint tool and used it as text color. After that i just deleted the content of the tab „General“ with the same cut functionality. To get the new field „Currency“ in place i took a new screenshot of an already existing currency field and pasted it in the first screenshot. And that’s pretty much it. It is a bit more effort required but in my opinion it’s definitely worth it. What we now have is a much cleaner and much more professional looking screenshot we can safely embed in our FS.